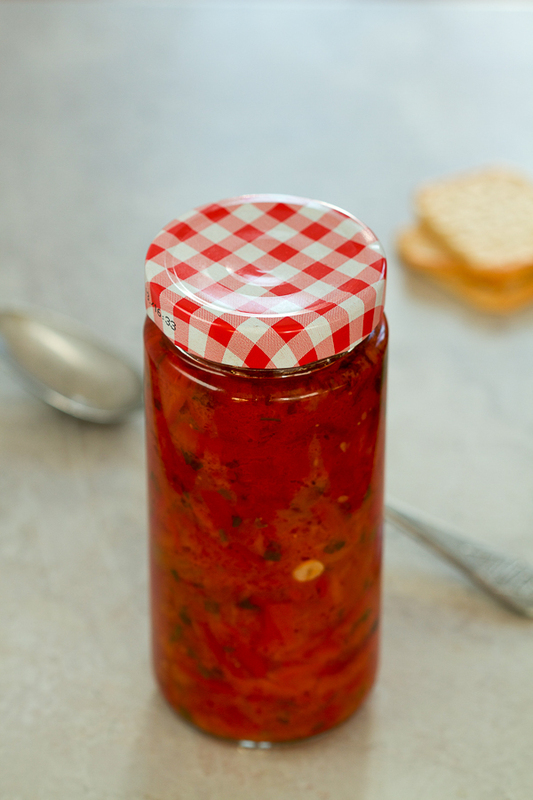 Pindjur is a luscious salsa-like spread made by roasting tomatoes and peppers, and then simmering them over medium heat with herbs and garlic. If you’d asked me what pindjur was a few years ago, I’d vaguely remember it was a spread something like ajvar, but not ajvar. (Ajvar is the famous Balkan roasted eggplant and red pepper spread.) The story would end there. You think kids are picky? My obsession with mom’s ajvar is so deep I often lie I’m allergic to peppers when someone else offers me the ajvar they made. Call me a snob. But I’ve tried enough ajvars in my life to know exactly the proportion of eggplant to peppers I love. There is also my disdain for ajvar made with garlic, so that deletes most of them from competition. 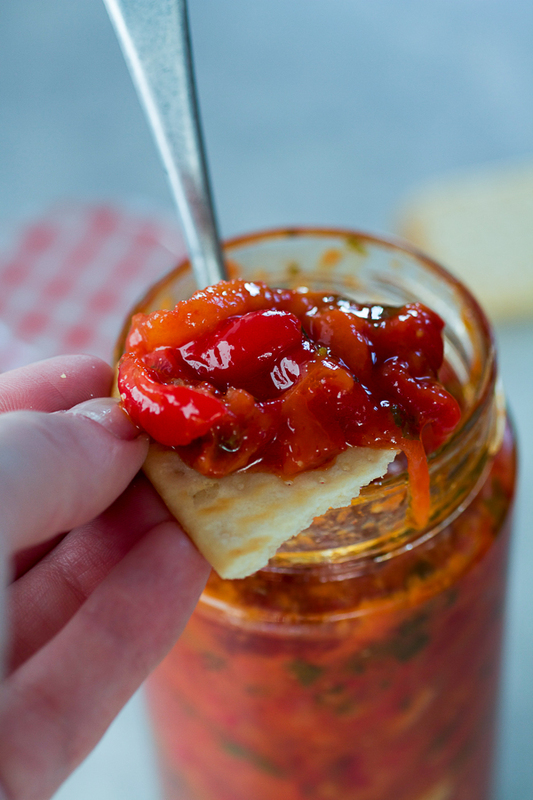 Finally, a perfect ajvar has to be just the right balance of sweet and savory. Just one additional step in either direction ruins the whole thing. So to think I’d like pindjur (pin-jooh-r) was incredulous. It never crossed my radar that an ajvar-like substance (minus eggplant, plus tomatoes and garlic) would leave me so… satisfied. Of course, it wasn’t just any pindjur. It was Ms. Ifeta’s pindjur. You may remember Ms. Ifeta from the minced meat dumplings recipe. She’s hard to forget. She invited me to make pindjur with her one Monday morning at 9am. These days, it’s this sort of thing that makes me giddy. I was way behind Ms. Ifeta in productivity though. That Monday morning she’d already been to the doctor’s, and had roasted the first batch of peppers and all the tomatoes by the time I arrived. The rest of the process took another couple of hours. Like ajvar, pindjur also requires that time be put in to make it. The difference in these two, besides the ingredient swap, is that pindjur is more dip-like. Salsa-like. 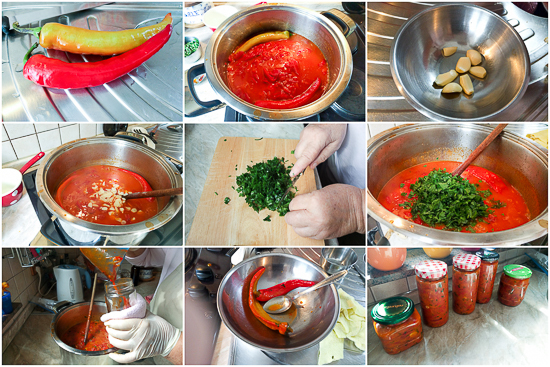 Ajvar is completely ground down, and simmered for a lot longer. It’s definitely a spread. Pindjur is chunkier, thicker, redder. Pindjur requires you to really bite into it, to slurp those chunks of peppers and garlic. You cannot eat pindjur without it getting on your hands, chin or the table. 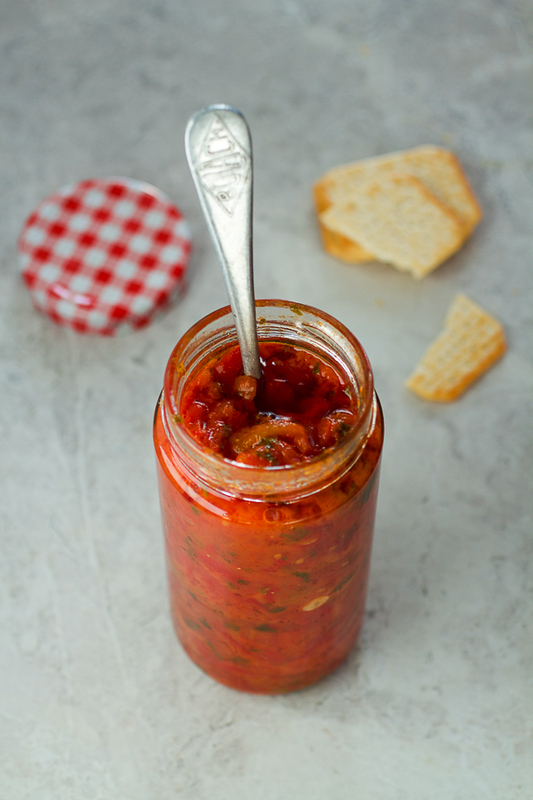 Pindjur has the sweetness of ajvar, but it’s a more acidic. Acidic in the right way. Can you conjure up the taste of salt and vinegar chips in your mind? That’s the kind. 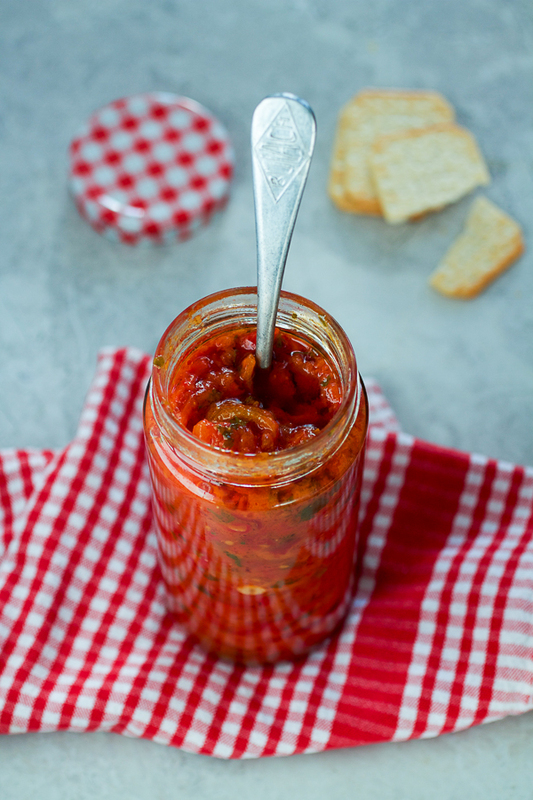 If you are choosing between which to make, ajvar or pindjur, the question is whether you’re more of a spread or a dip person. If you’re a dip person, go for pindjur. 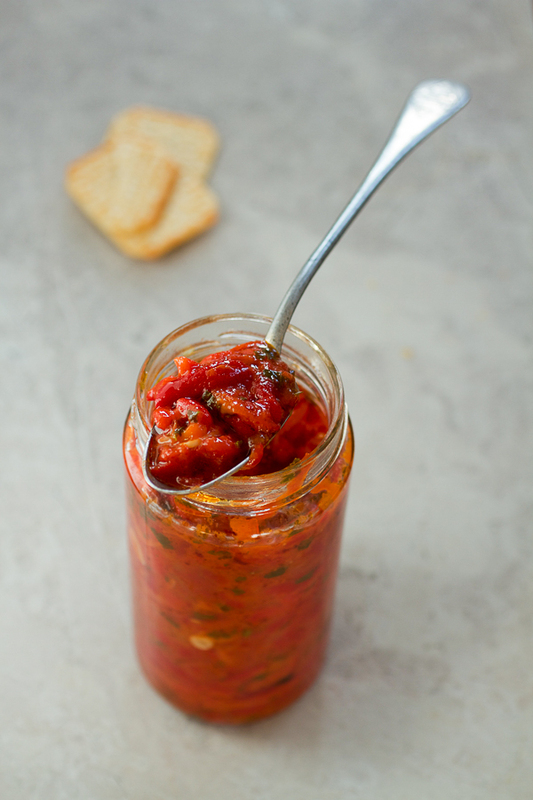 If you’re a spread person, then go for ajvar. Otherwise, choose based on vegetables.If you like tomatoes, do pindjur. If you like eggplant, do ajvar. My recommendation though? Make both. Suffer for a weekend or two, and have an entire winter worth of dips and spreads worthy of kings. Please read the entire recipe before starting. Some processes are to be done parallel to each other. Wash tomatoes, and place them on a thin baking sheet (or pan) covered with foil. Roast for 20-30 minutes, or until tomato skin shrivels up. Take tomatoes out of the oven and set aside for a few minutes. Raise the temperature in the oven to 480°F. As soon as you place peppers in the oven to roast, carefully skin roasted tomatoes and transfer to a large pot on the stove. (Tomatoes should fill up only about 1/3 to 1/2 of the pot as the peppers will be added later). Crush tomatoes with a potato masher (do not dice or cut up, only press, crush and squash), and bring to boil on medium, stirring frequently. (Stir well and often throughout the process.) Bring temperature to low and keep boiling for several minutes or until tomato juice thickens a bit. Add oil, and simmer for several more minutes. Add sugar and vinegar, and stir well. Bring the temperature up to medium and simmer for one full hour (60 minutes) stirring frequently. This is around the time when you should take the peppers out and turn the oven off. Protect your working area, whether it’s the floor, a table, or the counter. Prepare a large bowl with water, and one bowl in which you’ll place peeled peppers. Put on your gloves. Peel peppers by removing the stem and discarding it. Then flatten the pepper out so its insides are exposed. Use a knife to scrape off all seeds (then discard them), but make sure you’re not scraping off pepper meat. The next step is to peel off all of the skin, and the black dots that formed while roasting. This is a tricky part as you may lose some pepper meat (and even some of the peppers, as they might be bad quality and too thin to peel). You can use your fingers or a knife to peel the peppers. You’ll soon find your preferred way of doing this. Once a pepper is peeled, if necessary, dip it in water to remove a final few seeds and quickly transfer to the big dry bowl. Although it’s easier to dip the pepper in water first and get rid of all seeds that way, don’t do it. You want to keep as much of the pepper’s own moisture, fluid and juices, so keep the contact with water to a minimum. Repeat this process until all peppers are peeled. Cut peeled and deseeded peppers into one-half inch stripes. By now the tomatoes have been cooking for about an hour so add the peppers in, as well as 1-2 chili peppers (whole) and salt to the pot. Stir well. Cook for another 45 minutes on medium. Again, stir frequently and thoroughly. Halfway through the previous step, heat oven to 200°F. Wash your glass jars with water and detergent, rinsing well. Then line them up in a deep pan, and place in the warm oven for 15-20 minutes. This will sterilize them. Take out of the oven and don’t touch. Peel garlic cloves, then slice. Add to the pot and stir. Wash and mince parsley. Add to the pot and stir. Add salt and stir. After peppers and tomatoes have been cooking for 45 minutes total, turn the heat off. Take the chili peppers out of the pot and discard. Wearing gloves, get a kitchen towel and use it to pick up a hot glass jar then transfer hot pindjur into it carefully. Continue filling jars until you run out of pindjur. Fill each jar all the way to the top, and close each lid tightly. Store in a cool place. Pindjur keeps up to a few months. After you open each jar, transfer it to the fridge. Serve alone with bread, crackers or biscuits, or as a side to your main meal. 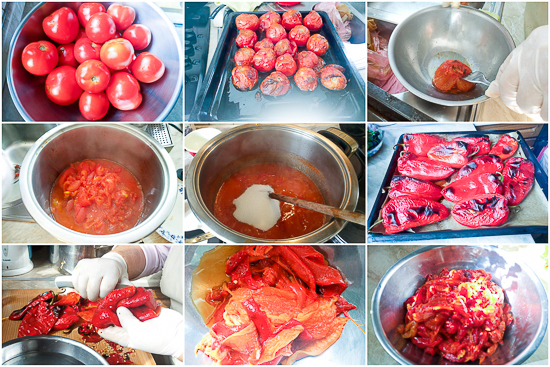 Like for ajvar, wear a pair of latex gloves when making pindjur. As you’ve noticed, I was not overly precise with the total time needed to make pindjur, as well as the number of jars you’ll need. The process takes about 3 hours (maybe a little bit more if you’re making it for the first time), but this greatly depends on the type of oven you are using, and if you’re roasting peppers and tomatoes in more than one batch. The same with jars – I cannot tell you about the volume due to the jars we used having been of different shapes and sizes. As with ajvar, I like to use small jars for pindjur. This way everything is consumed when the jar is opened. Hi Aida, FYI, when I click on the Print button by the recipe, I get a page full of nonsense symbols (question marks, random letters, and so on). Not sure if it’s just my computer or if others are seeing that as well. Other than that, though, the recipe looks delicious! Thanks for letting me know! What browser are you using? Try doing it from Chrome as it’s working fine there. Meanwhile I’ll get in touch with my web designer about the other browsers. I’m using Firefox 49.0.1. I’ll try Chrome, though. Firefox is now fixed. Let me know if it works for you. My web designer will continue working on it. Until then there is always Chrome. Thanks again for taking the time to let me know about this. You are my HERO! My husband and I went to Istanbul a few years ago. We ate this spread at breakfast, lunch and dinner. It was so good. We couldn’t get enough. I have been trying to figure out what it was called and find a recipe ever since then. Thank you. I can’t wait to try this! 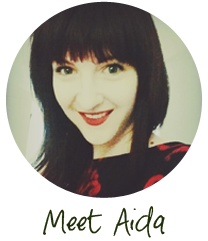 Bridget, thanks for visiting the blog! Glad I could help. 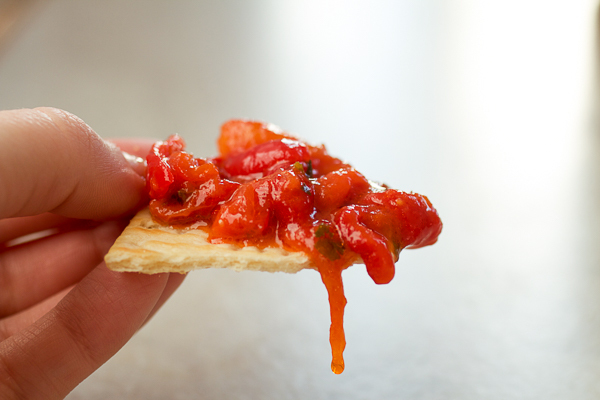 You may have eaten pindjur or ajvar… If it was more chunky and tomato-ey it was probably pindjur. 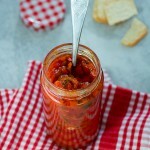 If it was more smooth, then it was ajvar (https://balkanlunchbox.com/the-ultimate-guide-ajvar-balkan-roasted-red-pepper-eggplant-relish-spread-chutney/). If you make it, let me know how it turns out. I hope you guys visit some more fun places soon. Loved this story and recipe, being a huge fan of pindjur. By the way, an old friend from Novi Beograd claimed that it’s also called summer ajvar! Thank you. Did not know that about pindjur, I love learning different regional dish names. I miss Beč! My husband is macedonian, and had asked me for 6 years to make pindjur! Thanks to you, I finally made it and now I will be able to pass your recipe down to my daughter’s. Thanks heaps! Anytime Kristen! Let me know if there are any other recipes you’d like and we’ll put them in rotation.